Everyday Fashionista - Atlanta Blogger: Who Can It Be Now? I MADE IT TO DAY 150! Day 150 of the Fashion Challenge! When I was getting dressed this morning, I wasn't sure I had the energy to look through the different sections of my closet to find an unworn outfit. I tried on several options, and then discarded them, because they either need to be altered or are not appropriate to wear to work. Then I stumbled upon this old dress. I have had this Ann Taylor Loft dress since 2005 or 2006, and I'm really thankful I still fit in it. The basic a-line silhouette is one that hasn't gone out of style, and paired with a little cardigan, it's perfect for the office. I'm also wearing my "Izzie" accessories today: my Izzie necklace (the pug with "Izzie" imprinted on it that my friend Laurin gave me for my birthday last year) and my Jimmy Choo Izzy Slingbacks. I am definitely having a difficult day already, since I went to bed too late and ended up struggling to open my eyes this morning. It was really tough to get through my workout, and I generally feel like it is taking me ten times as long to do any simple task. I did not stay up late last night for any good reason, either. After Chapin's wonderful meal of grilled duck, polenta, sauteed mushrooms and red wine from our Alpha Omega wine club, we watched TRON: Legacy on Blu-Ray. As I had not seen the first one, I wasn't sure what to expect, but I geared myself up for a good action movie. While the visual effects were amazing, and some of the initial action scenes were quite tense, the overall plot just had me muttering, "This is stupid," over and over under my breath as the movie neared its end. One visual effect that was sort of jarring was a character that was supposed to be Jeff Bridges as he was 20 years ago. Looking at his face as he speaks, you know something's off. It was just weird. Take my word for it. After the movie, I planned to go to sleep, but then I remembered that Tori & Dean's show on Oxygen was coming back for its season premiere. I am not one for reality shows, but I am sucker for anything 90210, and, of course, Tori Spelling is a huge lover of pugs. 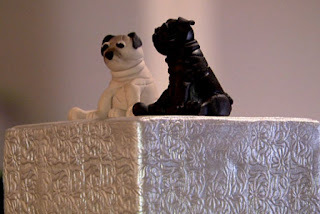 This season, she and her husband are planning weddings, and last night's wedding had a pug theme. How could I resist? The answer: I didn't!